When we last left the Pentacle’s Man in Card Seven, he was taking a break from all his hard toil to contemplate his achievements to date. He needed to review his plan or goal to determine if he was still on track and whether any changes needed to be made. He had been working very hard for a long time and was on the brink of reaping the rewards for all his sustained and constant effort. He stood in a field of flourishing Pentacle Plants that he had painstakingly cultivated and nurtured from seedlings. He had given his all to the crops that surrounded him and had thoroughly researched his farming methods, being careful only to use the best quality seedlings, and ensuring that the soil was the perfect environment for them. He had left little to chance and had sought the advice of experts instead of jumping in without a clue in the world. The Pentacle’s Man never liked taking risks so he was honest and upfront about what he knew and didn’t know. Neither did he claim to have abilities he hadn’t. Whatever he lacked, he trained at or read up about. He was not prepared to leave room for any errors as this was his window of opportunity to success, and the realisation of his dreams. And so, he worked night and day, and at times became oblivious to what was going on in the world around him. Friends and family barely saw him as he was putting all his time, energy and resources into his ambitious goal. The Pentacle’s Man knew that this was his chance and he was going to throw himself totally into the job at hand. He knew all too well, how circumstances can change rapidly. One day financially sound, healthy and fit, the next day bankrupt, stressed and ill. It had happened to him, imagine him, a Pentacle Man falling on hard times? Yes it is hard to imagine but it happened. It happened back in the Five of Pentacles when he lost everything except the shirt off his back. He had got off to a marvelous start in the Ace, when Spirit handed him his first Pentacle and nudged him towards the pathway that led out of the garden and off into the hills. His Pentacle was large, heavy, sturdy and solid. It was also worth a considerable sum. With this Pentacle he could really do something, make something of himself and build a good life for any family that came along. Spirit told him to use the Pentacle wisely and not to waste it on trivial items. Before he headed off on his path, Spirit told him that ‘when you have nothing, it is hard to get anything but when you have something, it is easy to get more’. Therefore if he worked his Pentacle well, it would yield more Pentacles which would yield even more Pentacles and so on and so on. However, should he let the Pentacle slip away between his fingers through negligence and lack of thought or planning, it would be very hard to get it back again. The Pentacle’s Man understood the message contained and he assured Spirit that he could be trusted with his precious gift for he was a responsible man, practical and down-to-earth. Never would he do anything silly that would endanger his Pentacle or weaken its worth. In The Two of Pentacles he set straight to work and found a way to double his gift. He found some part-time work which just about covered his expenses, while he saved as much as he could, adding it to the original Pentacle. He had a plan. He wanted to go to college and study to be a Stone Mason. He was fascinated by old historical buildings, especially the ancient churches near where he lived. Growing up he had often spent hours on his own, studying the intricate work and marvelled at the craftsmen who had put so much effort and time into their trade. He would run his fingers along the grooves in the old granite stone and imagine how wonderful it would be to do the same. He knew what he wanted to be when he grew up and told his teachers and family on numerous occasions. No one doubted his childish dream for they could already see promise in this young boy. His schoolwork was excellent; his handwriting much older than his years and his attention to detail and homework quite superb. He had been a joy to teach and never got into trouble with anyone. Such a sensible young man indeed. It was a bit of a struggle making ends meet while working and saving. He remembers that period of his life as being very stressful. He cut back as much as he could but still there were bills to pay and food to put on the table. At times he thought he would have to dip into his savings for there seemed to be more money going out than coming in. It was all a bit of a juggling act but he just kept his head down and kept going. In the Three of Pentacles, he started college and his Stone Masonry Apprenticeship. He was to gain his knowledge first-hand while working on the restoration of an old church. He worked under a team of mentors; expert craftsmen, architects and historians. He followed their guidance and instruction and before long he was allowed work on some of the less intricate pieces. He was thrilled to get this opportunity and to be picked for such an important task. The college mentors had chosen him because of his ongoing and sustained results in exams and assignments. He showed a deep interest and dedication that very few of the other students did. He had demonstrated consistent high standards in all his work. He had been singled out to work beside some of the top Masters in their Field and he felt honored and privileged to be handed down this knowledge from such passionate men. It was true he had a vocation and all could see that he would go far. In the Four of Pentacles, he landed his first commission and was handsomely paid for it. He was selected from a panel of Stone Masons to completely renovate a number of buildings in one of the oldest streets in the city. He threw himself into the work and as the money came in he began to save and invest. He became obsessed with his work and was always the last one to leave the building. He refused all offers of social invitations and the opportunity to have a bit of fun. When he was obliged to attend official functions related to the building work, he rarely mixed and was known to be tight when it came to buying anyone a drink. He believed it was a waste of money, money that could be better utilised elsewhere. Those who worked with him thought him mean. Rarely did anyone see him dressed in anything other than his Stone Mason’s apron, covered in dust, with hammer and chisel in hand. He had turned into a very serious fellow indeed and his mood was often dour and unfriendly. He hated anything that got between him and his work. The only other thing that held his interest was checking his bank statement and investments. He had plans, big plans, not like the others who would be content to work for someone else in exchange for a small fee. He wanted to become his own man and run his own business. He wanted full control and knew he could do it. If he was in charge, there certainly would be no slackers. In the Five of Pentacles, his whole world fell apart. On travelling to work one morning, he stopped to read the newspaper on a street stall (rarely did he buy one). The headlines had caught his attention and his eyes nearly popped out of his head when he read them. It appeared that the bank where he had kept all his savings had collapsed. They had closed their doors and would not reopen them. As he read on, the report told of angry scenes outside the bank. The bank’s customers had been told that their money was gone, all gone. There were riots on the streets, with people getting injured and even killed. The Pentacle’s Man dropped the paper and ran as fast as he could to the bank. He could not believe his eyes when he saw the mob that had gathered. He grabbed out at people shouting at them to tell him more. It was true, anyone who had savings in the bank had lost them all. There were rumours of bad investments and even embezzlement and fraud. There would be a huge investigation and inquiry. In the meantime, the money was gone. Distraught and horrified the man continued on to work as it was the only thing he could do. As he arrived to don his apron and collect his tools, he was met by two Officials from the organisation behind funding the renovations. They looked very serious. They asked him to step into a room as there was going to be a meeting. When he entered the room, he saw all his co-workers and even the administration staff. Something was wrong and that was for certain. Very calmly and with great dignity the Head Official began to speak. He sadly announced it was with great regret that all work on the renovations would cease with immediate effect. The funds for the building had been secured in the bank which had just collapsed. There would be no further money to pay for supplies or staff. Worse still, there would not even be enough money to pay the staff for the current week’s work. Amid scenes of shocked disbelief, the Pentacle’s Man had staggered from the room, bewildered and distressed. He had walked home in a daze of dread and increasing worry. Inside his front door, lying on the mat was a letter from his investment company. He knew before he opened it, that it was bad news. He knew the investment company had strong connections with the bank. That is how he heard of them in the first place. He had been advised by his Bank Manager to invest his hard-earned money with them. He was told it was rock solid and would yield excellent returns in years to come. The letter told him that his investment was no more. For the first time in his whole life, the Pentacle’s Man did not know what to do. His mind was in a state of panic and he was close to hysteria. His money, all his money gone. This was a nightmare, unbelievable. He was ruined. He had no money, no job and no savings. When the shock finally wore off he tried to secure employment but so many had lost their jobs as a result of the bank collapse that it was impossible. No one had the money to pay for professional Stone Masons anymore and all Government Funding had been withdrawn. There was always the Social Welfare but he was too proud to go there. He was not the type who had to take hand-outs from others. He had worked and earned his own way from the very start. What would people think of him if they saw him standing in a queue with all the other jobless people? No, that was not for him. He would get by somehow or other like he always did. The day the bailiffs came to repossess his house, he believed his world had come to an end. This was his idea of hell. He walked out onto the street, with just the clothes he was standing up in. It had begun to snow and there was a biting cold wind. He walked aimlessly as he had no idea of where he should go. The dreadful thing was, he had nowhere to go. He was all alone, no friends, no family, no money, no food and now, no home. As darkness fell the streets emptied except for those like him, who had nowhere to go. He looked at these ‘beggars’ and felt tainted by their proximity. He was hungry and thirsty but had no money to buy food or drink. Passing by a restaurant his stomach clenched when he inhaled the waft of cooking smells that drifted out as the door was opened and closed. Glancing in the window he caught sight of people he knew, people he had worked for in the past. They sat in front of large plates of food and drank rick dark red wine. One of the diners briefly looked out towards the window but the Pentacle’s Man withdrew rapidly. He was ashamed to be seen in such a disgraced and ruined manner. As he stumbled on through the night, getting weaker and colder, he thought for the first time of all the beggars and down-and-outs he had seen over the years. He had always blamed their lowly position on laziness and lack of ambition. Now he saw things differently. He could not be accused of being lazy, nor could he be accused of being lacking in ambition. However, he too was on the street, down-and-out with the rest of them. He had never stopped to offer them money or food in the past. Instead he had just passed by, ignoring their plight, believing them to be the responsiblity of others. He was found that night by a group of volunteer workers from the nearby Homeless Shelter in The Six of Pentacles. He had taken shelter in a doorway and half-frozen from the cold had drifted into an exhausted sleep. A young woman volunteer had gently woken him before leading him by the hand to a waiting vehicle. She wrapped a warm blanket around him and gave him a hot drink and some bread. The volunteers treated him so kindly he almost cried. Back at the shelter, they took his details before bringing him to a room where there were several beds. The beds were separated by curtains for privacy. The volunteer girl told him to get some rest and that they would talk more in the morning. As the Pentacle’s Man lay down his weary head, he was aware of the presence of many others sleeping in the remaining beds. Who were they, he thought? Were they beggars, the chronic homeless, down-and-outs, alcoholics or were they people like him? People who had recently fallen into bad luck, people whose circumstances had suddenly changed for the worse? He made a vow never to judge others again for terrible things can happen to anyone. After a good night’s sleep, the Pentacle’s Man had washed and ate of a hearty breakfast. He was then taken by vehicle to another building where he met with a man who took more details from him. He asked about his circumstances and if he had ever worked. When the Pentacle’s Man told him his story he empathised with him and told him that he wanted to help get him out of the bind that he was in. He told him that he needed to register with Social Welfare and then they would look through whatever employment there was to be found that might suit him. Unfortunately, he doubted if there would be any Stone Masonry work going. However, a job was job and a means of getting back on his feet again, a start so to speak. The Pentacle’s Man was relieved to be getting this help. If they hadn’t found him in the doorway the night before, he dreads to think what might have become of him. After signing on in Social Welfare, the Pentacle’s Man spent much time with the Employment Facilitator discussing possible positions. There was nothing suitable for him but they did come up with something else. It was a new Government Scheme that had been launched for those who wished to start their own business. The Scheme would provide training, mentorship and a start-up grant to successful candidates. The only draw-back was that funding was only for horticulture. The Pentacle’s Man, knew something of working the land for he was a true Earth type and loved being around nature and enjoyed working in the open. He would learn whatever he had to and if selected as one of the candidates he would show them what he could do. He would work really hard and make them proud of him. His heart still lay in Stone Masonry but he was a practical man and knew that for the moment, he would have to put that to one side. One day, when circumstances improved he would go back to it and take up where he left off. Right now he was being given a chance to get out of his dire financial mess. He was going back to work and would give this new project everything he had. His money and all he had possessed was gone. But for the charity of these wonderful people and many more like them, he might be gone too. He relished the idea of getting back to work and stuck into the job at hand. He would make a success of this and would be very careful not to put all his eggs in one basket like he did the last time. The Pentacle’s Man felt happy and was smiling. Gone was the dour, mean-spirited spendthrift of the Four of Pentacles. All that money he had and never the chance to enjoy it. He realised now that there was more to life than just money. 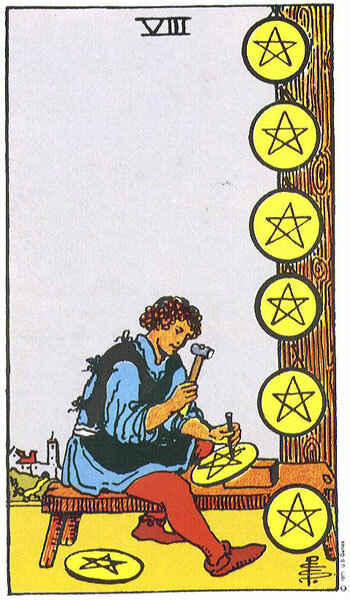 In the Seven of Pentacles he was put to work. His job was to clear a plot of land and grow a crop of Pentacles from seedlings. He would have to learn the whole process of cultivating and growing these profitable crops. Again, he had mentors and advisors who monitored his progress. He had made some good friends at the job centre and homeless shelter. Some came and helped out clearing the land and even though he worked hard day and night, he did try to keep in touch with them even though they complained they never saw him anymore. He would never forget his time on the street and the hopelessness of poverty. The Pentacle’s Man worked hard, day and night, just like he had applied himself to his Stone Masonry Apprenticeship. He grew stong and healthy working on the land and developed a deep love for farming. It turned out that he was green-fingered too for the Pentacles he grew where prize-winning. When they were eventually harvested and brought to market they made a record profit and his Pentacles were widely sought by buyers worldwide. It was a great success and he was rewarded well for his efforts. No longer on Social Welfare or under the watchful eyes of his mentors, he was free to take on contracts and began to act as a Consultant for Pentacle Growers. The money began to pour in again and bit by bit he managed to get back on his feet. He bought a small house in the countryside and ran his business from the back bedroom. He was kept busy and always seemed to be working in one form or another. Now that he was financially secure again, he began to think of his Stone Masonry days. There was the ruin of an old cottage on his land and he decided that he would restore it himself and use it as a building for facilitating Horticulture Workshops. As we join The Pentacle’s Man in the Eight of Pentacles, some time has passed since he dug out his old apron, hammer and chisel and set to work on his ruined cottage. We have journeyed far today to observe a Master at his work and hopefully get an interview out of him. We find the Pentacle’s Man, hard at work once more. We had rung the front bell several times but the man was so involved in his work he hadn’t heard us. Instead we just follow the sound of hammering that is coming from the back of the building and find him chiseling away. He is very welcoming in his greeting and apologises for not hearing our arrival. He explains that his wife is normally at home but today has had to deliver an order to a very important client. He tells us that it is easy for him to get so absorbed in his work that he would forget to eat. He said he would starve if not for his lovely wife coming to drag him in to the table. He informs us that he must continue with his work while we speak as he has certain deadlines to meet for the commission he is presently working on. ‘Please go ahead’ I assure him ‘that is what we have come to see’. The Pentacle’s Man returns to the bench he was sitting on and picks up his hammer and chisel once more. Bending down he lifts a thin round stone slab and rests it gently on a red brick. He is engraving the stone with a perfect Pentacle. As he chisels away, very rapidly but carefully, we take a good look at him. He seems older than the last time we met him. His face has filled out and his body too. His hair is beginning to softly grey in areas but he looks more relaxed in himself, happier I think. His red trousers tells me of the passion and dedication he has for his work and the sheer devotion behind every hammer strike. His blue top suggests the deep spiritual aspect and creative inspiration behind all his works of art. Here is a man who feels his work on a deep level. This is not a job to this man. As he lovingly engraves each stone we can see it is a vocation, a work of love, and we envy the sense of personal fulfillment he must feel. Oh to hear your calling, to know it and to follow it. To work at something you really adore must be the most wonderful thing in the world. This Man has that X-Factor for we can see it in his body and face. He is almost meditative as he goes about his work and am sure he has blocked us out and forgotten we are here. I draw him back by asking what it is he is working on? Without looking up, he tells me that he has been commissioned by a Luxury Castle and County House Group who use a Pentacle as part of their logo. For their Eight 5-Star Hotels, they want a Handcrafted Engraved Stone Pentacle to hang above each magnificent entrance. The order is to be completed and delivered by early next week. He is putting the finishing touches to the last three. He has five already completed and they are hung on hooks on the wall beside where he works. We ask if we can take a closer look? He just gives a nod of his head and carefully we walk over to them. From a distance, where we were seated, they looked magnificent indeed but on closer inspection, we gasp at the exquisite detail and skill that went into crafting these incredible Pentacles. ‘They are absolutely fabulous, just amazing’ we compliment him and he seems pleased to hear our remarks. ‘Tell me’ I ask, ‘how long does it take to complete each stone’? ‘About three days’ he replies ‘I have to prepare the stone first by sanding, smoothing and coating it with various solutions. The stone is very fine so I have to be especially careful when chiseling, as it is easily broken. This particular stone is very expensive, so breaking it is something we don’t like to do if at all possible’. He lifts the stone he is working on to his face and blows gently on the nicely forming Pentacle to clear the stone dust before settling it back onto the block. I ask him if he can tell me how much such a commission would cost but he just smiles at me and lowers his head once more. ‘I presume it costs a lot’ I prompt. ‘You could say that alright’ he replies ‘if you want the best, you have to pay for the best, and I am the best’. ‘I see’ says I. Who can argue with that? This man, this Pentacle’s Man is the very best to be found. He is a First Class Stone Mason and in recent years has travelled extensively working on some of the finest buildings in the world. He is Top of his Trade and highly qualified. He has endless letters after his name and can command a huge fee for his work. By God has he earned it though. We interviewed this Man some years ago when he had been awarded Pentacle Farmer of the Year after literally dragging himself off the ground and out of poverty. We had been told that he had lost everything in the big bank collapse and had been reduced to living on the streets. Luckily for him he was taken in and cared for by a Homeless Shelter Organisation who arranged for him to meet with Employment Officers. He had been a very willing candidate and those who encountered him were impressed by his work ethic and grim determination. He had served his Apprenticeship as a Stone Mason and had a highly paid job. He had lost that too with everything else. Stone Masonry had been his first love, but nevertheless he threw himself in wholeheartedly to learn the skills and art of horticulture. He believed that all knowledge was good and empowering. He was the sort of man who could turn his hand to anything and make a success of it. Not only was he a successful and brilliant Stone Mason, he also proved himself in Farming too. He had very quickly built a huge reputation and worked as a Freelance Pentacle Farming Consultant while also farming a bit of land he had bought. He met his wife at the local Country Market. Ambitious too, she was in charge of running the Market and had her own stand where she sold her homemade organic preserves. They made a right pair and as soon as they bought their country home, he started on renovating the old stone cottage on the land while she set about planting hundreds of fruit bushes and trees for her jam making enterprise. When he had the cottage completely restored he began to run horticultural workshops from it. He taught people how to grow their own, how to evolve organically and how to rotate the kitchen garden. His wife taught jam-making classes and they rented the building out to other workshop facilitators. It was during this time that people started to comment on the building as much as the workshops. They were amazed to learn that he had restored it himself and that he was a Qualified Stone Mason as well as a farmer. The knocks started coming to the door and the phone began to ring with enquiries as to his availability for specialist jobs. The Pentacle’s Man took on as many as he could for he truly loved his Stone Work. However, he had done no further training since his days before the bank collapse. He was not content with his level of skills and declared to his wife that he wanted to be the best of the best so he was going to take some time out and get further training and qualifications. He had very high standards and he now had the money to go back to his first love, Stone Masonry. He travelled to Italy and spent 6 months training on very fine detailed work in ancient abbeys, cathedrals, castles and medieval villages. By the time he came home he was a new man and highly qualified. He built himself a separate workshop area for his stone work, set-up a website and declared himself officially open for business. While he was in Italy, his wife had enrolled on a course in internet marketing while the children were at school and so was ready to work beside him once he returned. He already had a name for himself before he went, but now he was in a whole new league. His enquiries were for very specialised work and they came from all over the world. His business grew rapidly as he built success upon success. He still had his farming business in operation, still worked part-time doing his consultancy business and also taught workshops when he could. If that was not enough, this man wanted more and this is something I want to ask him about. Won’t you miss this place and what about your wife and her garden? It must have taken a lot of hard work to get it to this stage? Will she have to start over again?’ I ask, amazed by the sheer work that would be involved in recreating this environment elsewhere, and from scratch. ‘We are looking forward to the challenge and neither of us are afraid of hard work. We know the ingredients of success and will just apply what we have learned here to our new place. We have a lot of experience behind us so are confident of our abilities. It will be a success don’t you worry. We only deal with success these days. We want to put a lot of effort into creating a lovely home for us all to live happily in. We know exactly what we want and are working closely with architects and builders to get just the right look. There will be wonderful walled gardens and orchards. We are not getting any younger either and want to be comfortable and enjoy our old age. I am sure we won’t be able to keep this pace up indefinitely’ he laughs. ‘Sounds like a splendid idea to me. And what of your children, are they happy with the move?’ Well my young lad is already in his apprenticeship with me and I think he is going to be even better than me when he qualifies. He is showing remarkable talent for one so young. I am very proud of him’ he beams and I ask of his daughter and her view. ‘Oh well, she is the wild one of the family and wants to travel before deciding on any career. I don’t know where we got her from.’ he says fondly but I can tell that the interview is drawing to a close as he puts his head back down to is work. ‘One last question if you don’t mind?’ ‘Fire away’ he jokes. What advice would you give to all the young boys and girls out there who are just starting out? I move closer to hear his reply as people generally pay him money for his advice. Work hard, and then work harder even still. Set yourself a goal and work towards it. Do something you really want to do because you will be a long time at it. Work, but not just for money’s sake. You must love the work you do or your work will never amount to much. Once you find what you like or are good at, then commit yourself to it and go for it. Set your personal standards high and never waver from them. Be the best you can and then try to improve on that. No matter how old you get, you are forever a student. Education and retraining keeps you fresh and young. Get qualified in something and then add to it. You have many abilities and can do more than you think. Never, give up no matter what happens. Keep your head down and keep at it. Once you believe in yourself, others will too. Never be too proud to ask for help. Think success and you will be a success. Share your Success with others. Give something back. Expect only the best and never settle for anything less. Have patience and learn to pace yourself. Make sure you have a contingency plan.’ He looks down at his work briefly but I can see he has gone somewhere else in his mind and I presume he is remembering his own past and all he has learned along the way. You cannot beat experience and this man has it in bucket loads. I thank him for his time and wish him the very best in his new home and with the Pentacles School of Training. He doesn’t see me out but is kind enough to invite me to the launch of the school and asks me to promote it as best I can. ‘I will be delighted to’ I assure him and then head back the way I came. As I get into my car I think of all the lucky people who will get the chance to come to the school here. He has assured me he will work closely with the school and be involved at every step of the way. I do hope he hasn’t taken on too much, but he is fit and healthy looking and from what I know of him, very sensible too. I am sure he will not overdo it. He certainly has made great progress and is in a very strong financial position, top of his game and in a league of his own. Expert, Master, Genius. After the careful handling, maintenance and future planning in the Seven we now see the efforts begin to payoff. Here is a man diligently carving a Pentacle. On the tree hang Five Pentacles, which he made earlier. Another two lie on the ground by his feet. He pays great attention to his work. This is the Apprentice that was seen in the Three of Pentacles as he studied and developed the skills that would bring him financial reward. He has now matured into the skilled craftsman or tradesman who pays meticulous attention to the quality of his work. The red tights and shoes symbolise the passion he puts into his work. We get the impression that he is so involved and intense with his craft that he is oblivious to the fact that he is on his own. However, this may be deliberate on his part as he prefers as few distractions as possible. He gets everything he needs from his work. The man has at this stage in the journey of the Pentacles has realised that working and having money is not enough. He now understands the importance of his work is not only to bring him financial rewards but also to bring him personal fulfilment. He realises that to be really good at what he does, he must be happy doing what he does. The town in the background is the same town found in the Four of Pentacles. He now knows what the town needs, who his clients are and the products they require. *We will next visit the Pentacles in Card Nine and we shall see this time if they have managed to maintain their success or will we find them back in the scene from the Five, after losing everything again? They do seem to be in a very strong position at present and it is wonderful to see all their hard work beginning to pay off. They have certainly earned every cent of it. I wonder what changes the Pentacles will have made to their life in Card Nine? Will they still be working as hard as they known to or will they have relaxed a bit? I do hope they are taking enough time off to enjoy their success as it would be a pity to see them working their fingers to the bone until the day they die. We shall find out soon enough. Thanks so much for this explanation. I have read lots of books on Tarot that say that the 3 of Pentacles is a master craftsman and the 8 is an apprentice. It’s never stuck me as right – that a 3 is more developed than an 8. Here is the answer I’ve been looking for. Your explanations make so much sense. I’m ditching the books and sticking with you! Hi Josephine. Thank you for your lovely comment. I was always taught that the Three of Pentacles was the Apprentice and The 8, the Master . Three is about growth, progress and development, the role of the Apprentice as he learns his craft. Eight is about power, speed and strength. The Master is accomplished and qualified. I still have much work to with with rewriting the many of the Cards. 5 to 22 in the Major Arcana still need to be reworked along with tidying up the Queens and Kings. Will get there eventually. Wow this is lovely. I’ve never really understood tarot before despite the years I’ve had friends who were interested. But I do have this habit of finding playing cards in the street and when I look them up they are symbolic of something in my life. Your description of this card could not be more accurate, and the story you told has made the card, and now perhaps all of tarot more accessable to me. I never really knew the story if the journey of each suit before. Thank you so much for this brilliant description. It has made my day and I look forward to reading the rest of your site. Wow CJ, thank you so much. I am working on new cards all the time so will have lots more stories to follow. Glad you are enjoying it. Awesome work. I’m truly impressed by the knowledge, devotion, love and the deep look you take into the precious language of the tarot. The full description of the deep underlying pattern of the whole suit is priceless, specially when fleshed out in such a mundane storyline, so very appropriate for the suit of pentacles and a strand of the art of Living that the Tarot heralds. Tarot is (together with astrology) one of my dearest passions and one of the sign systems I trace and I listen to when navigating Life. Lately, I keep getting the 8 of pentacles in my readings and I actually resorted to the internet looking for some other voices other than my own. I was hoping for an in-depth vision of the 8 of pentacles that complemented my own feeling of it, that really resonated. And here I landed. I got goose pimples when I read your great piece. Funny that it’s also made me realise that I ‘ve been myself into tarot like the man of the 8 of pentacles :-), for years, hours on end, absorbed, out of devotion and of some sort of calling from early on in my life -I ain’t no master, though. And I keep on getting some people saying I should do something out of it in a professional manner, specially at this crossroads in my life. I just never feel my work is quite good enough for such standards; ‘I need to work more on it, I need to be more connected, more…’ -. 8 of pentacles…indeed. Thank you so much for your excellent work and very specially for the crafted-love of the tarot that shines throw your words. Well here is your mate. I never feel good enough either and am my own worst critic. I fuss and fret every time I release new content. You say you have given years and hours on end to tarot and feel it is your calling, yet worry that you are no master. I can tell you that I am the farthest thing away from Master you can get. I am not a Tarot Purist. I care less for many aspects of tarot that Masters might obsess over. I write about tarot, not so much in tarot fashion but rather via an engagement with my creative imagination. Yes, of course, the principles of tarot must be applied but not rigidly. There are so many schools and systems of tarot out there that who can say which is right and which is wrong. Whatever works for you! I regularly get comments from tarot students who say that this or that aspect or approach is wrong, but I am not attempting to sway anyone. 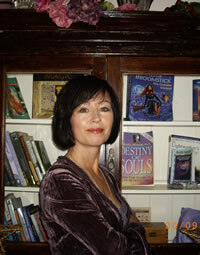 I aim to bring the imagery and characters to life through story telling using the Elements and numerology to guide me. That is where my work with tarot lies. I will leave the rest to others. I too am the 8 of Pentacles and at times find it hard to finish a project for release. I continue to pick at it. Like the Empress, I am not always to keen to let go of my creations. You have it in you, yet feel its not enough. Believe me, no one will judge you in that manner at all. You are every bit as good as the rest and I bet you have your own unique version to share with the world. It all helps when learning tarot and my advise to students of tarot is to read as many variations on the subject as possible. Sticking rigidly to one system may seem the way to go, but it cuts you off from other experiences. I would have a go and just do it. I will be launching a YouTube Video Channel for my site this year, once I learn how to use the equipment, but am nervous of being in front of the camera and making a fool of myself. I have watched many tutorials and the advice they all give, is to just do it. Just jump in and learn as you go along. It will get easier and easier. If you wait until you think you have it perfect, it will never happen. They warn to be prepared for the initial videos to be a mess but its the only way to go. I do hope you bite the bullet and take the advice of your friends. I am with you on that one. Sometimes we pick and pick and pick at something. Turn it this way and that, go over and over it and in the end still find fault. 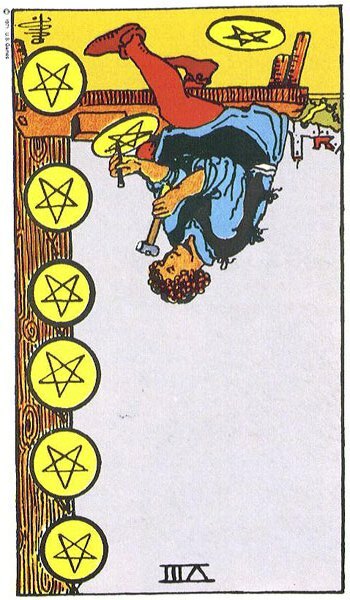 The Eight of Pentacles very much shows this exhausting side of perfectionism. The pentacles lying on the ground are versions of his products he has discarded, binned, deemed not worthy for anything but the bin. They may have taken a lot of his time and resources, but he cannot stand over them. The pentacles on the tree, being a series of drafts, none yet to his satisfaction. He is working on his latest version, which will likely become another draft to join the others. At what stage will be satisfied and say ‘there, tis done’ ? Meanwhile, other business thrive in the background selling items and products that are dreadfully sub-standard in comparison. They do not have any qualms about taking money for them, and the customer happy with what they consider value for money. If the figure beavering away could just step back and say enough, enough, set a deadline for final completion and release his creations to the market where the punters will quickly let him know if what he has is of worth and value. Yet, along with his own inner-critic, he also fears the criticism of other, the negative feedback, the trolls who never have anything good to say about anyone or anything. 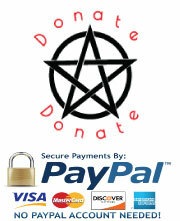 As a true Pentacle, he is seeking a guarantee of success and acclaim before he will release. He wants to know it will be a success rather than take a risk, a chance and throw it out to see. After all his effort when he goes to do his costings, he will find that no one will be able to afford them if he includes his exact labour costs. He will be working at a loss if he spends so long on each item. He would need to sell to the higher income customer, but that might make him even more meticulous and self-critical. Tough one for sure!